Daihatsu Motor Sales produced produced prototype electric vehicles in the 1970's. The EV1N was a 4-passenger car using 104 volts of nickel-iron batteries. The vehicle claimed a maximum speed of 101 km/h and a range of over 200 km on a charge. The HiJet van and pickup claimed a speed of 75 km/h and a range of 60 km on a charge. Daihatsu was absorbed by Toyota in 1968. 1998 saw the merger of the Chrysler Corporation (number 3 automaker in North America at the time) and Daimler-Benz (a major auto and truck maker in most of the world, known primarily for the Mercedes-Benz marque of luxury cars). The Chrysler Corporation converted a Simca to electric power in 1967, and co-operated with General Electric to build an electric car for the U.S. Department of Energy in 1979. The British operation of Chrysler built an electric delivery truck known as the D-50. It was interesting in that the electric version of the truck was built on the same assembly line as the gasoline and diesel versions of the truck. A blacksmith in Vermont, Davenport built a small electric vehicle circa 1834. Davidson, of Aberdeen, Scotland, built an electric locomotive in 1837 or 1839. The Dayton Electric Car Co. of Dayton OH operated from 1911 to 1915. It produced a small number of electric cars, although sales literature listed as many as six different models. Like the ghost of the Dayton Electric Car Co (1911-1915), this company appeared somewhere around 1980 to produce a 4-seater electric car based on a VW Beetle chassis. The DeMars Electric Vehicle Co. of Cleveland OH produced electric cars in 1905 and 1906. This vehicle was one of the first to use an electric headlight. Chain drive and a 1.5 hp motor were used. 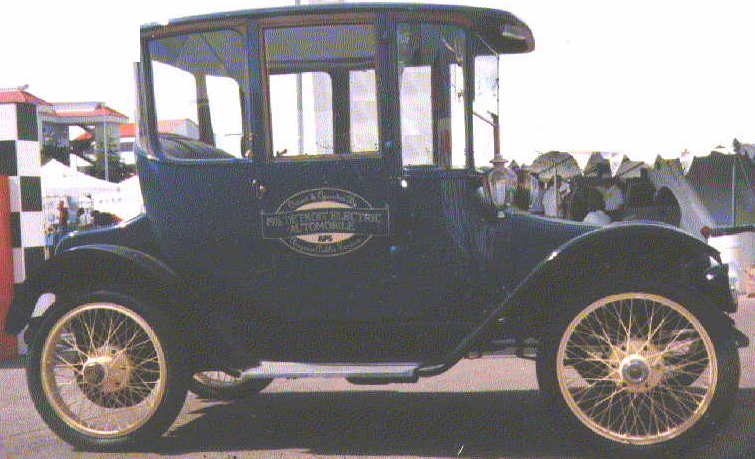 This was essentially the same vehicle as the Blakeslee of 1906/1907 and the Williams of 1907/1908 (due to changes in the ownership of the company). This was a one-off electric racing car built by Driesbach Electromotive, Inc of Santa Barbara CA in 1982. 2 feet high, 4 feet wide and 19 feet long, this streamlined single-seater used nickel-cadmium batteries and boasted a top speed over 115 mph and a standing 1/4-mile elapsed time of 14.49 seconds. O. de Ruyter Demissene of Brussels (Belgium) built a few light electric cars from 1901 to 1903. 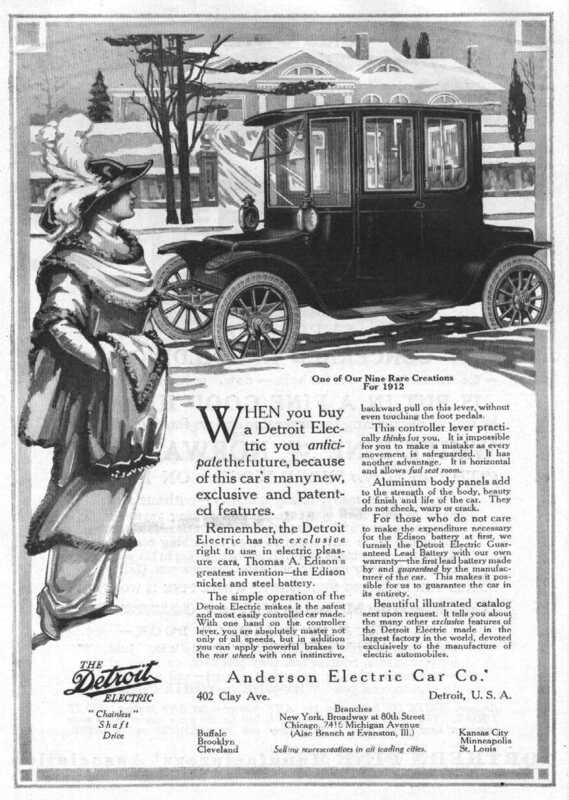 The Detroit electric car was produced from 1907 to 1938 by the Anderson Carriage Co. (1907-1910), then the Anderson Electric Car Co. (1911-1918) and finally the Detroit Electric Car Co (1919-1938), all of them being located in Detroit. The 31-year span of production makes this one of the longest-lived electric cars being produced, and it was one of the more popular makes of electric cars in the U.S. While more than 1,000 vehicles per year were produced some years prior to 1914, production fell off after that and dramatically into the 1920's. During the 1930's production was on an as-ordered basis only, and very few Detroit electrics were produced after 1935, although orders were apparently accepted until 1942. Starting in the 1920's, the Detroits started to use body parts from conventional car-builders which tended to make the cars look more like gasoline-powered cars, including some with vents in the hood. There is a 1914 and a 1922 Detroit Electric in the holdings of the Henry Ford Museum in Dearborn MI. 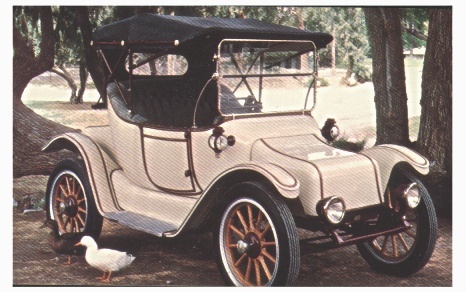 The 1914 Detroit in the collection was that of Mrs. Ford. While she always had a personal vehicle from the time Ford was mass-producing vehicles, she never drove a Ford, only electrics. Stories of the period indicate she felt gasoline was too dangerous. The Zschopauer Motorenwerke J.S. Rasmussen AG of Berlin (Germany) produced electric cars in 1937. These vehicles used a wood-framed body and no conventional chassis, which allowed for a lighter vehicle than many of its contemporaries. This construction was carried on into the D.K.W. line of vehicles which were produced after the electrics, and for which the company is better known. The D.E.W.s were often used as taxi-cabs. The Dey Electric Co. of York PA built a three-seater runabout in 1917. Alfred Dinin et Cie. of Puteaux (France) built a small 2-seater electric car in 1904. The batteries were placed under the hood, and the vehicle looked somewhat like contemporary gasoline-powered cars. 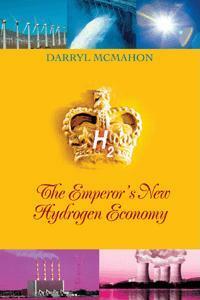 There were both an electric bus and a gasoline-electric hybrid car known as the Dragonfly in the late 1970's. Developed by Daimler-Benz and AEG-Telefunken in Germany, this dual-powered electric bus was shown at the International Electric Vehicle Symposium in Dusseldorf in 1976. The vehicle could be operated from overhead wires as a trolley-bus, or independently using on-board batteries. A later version of the vehicle appeared in 1984 using a diesel engine with the overhead wire hookup.